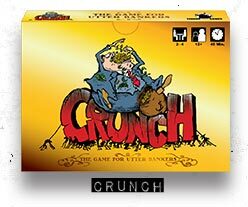 "Fat cat bankers in a race to the bottom and a sweet retirement"
Crunch is a card game for 2 to 4 players that allows you to experience the upside of down. Placed in the role of a global banking CEO, you are pitted not just against the other players, but against your own bank too. The Crunch is here! Our financial foundations are crumbling, while our nation's cherished traditions of greed, profit and exploitation are deeply threatened. As the CEO of a global bank, it is your personal responsibility to do whatever it takes to ensure a comfortable retirement. Call in government bailouts, award yourself bonuses and - when non one's looking - embezzle as much as you can, before it all comes crashing down around you. Just a small sample of the deviousness that this game demands. From left to right: Bonus Time, Outsourcing Overseas, Too Big To Fail, Rebrand.